Your Sommelier is run by two UK-based French wine enthusiasts who, after several years in the banking industry, decided the time was right to follow their passion for wine. Each wine is selected by one of their sommeliers, focused on “quality, but also making sure you get the best value for the price.” They offer wines in two ways: as a series of weekly private offers sent to members, and a monthly wine box subscription plan. Both supply exclusively French wines and Champagnes imported directly from the producers. The weekly private offers focus on a handful of wines from a single producer. Membership is free with no commitment to buy, and at the end of each week orders are compiled and the wines shipped direct from France. The monthly box plan will deliver three themed wines, complete with collectible fact cards about each (and a ring binder in which to keep them). There are two levels of subscription: ‘amateur’ which costs £36 per month for the three wines, and ‘expert’ which costs £60 for the three wines. 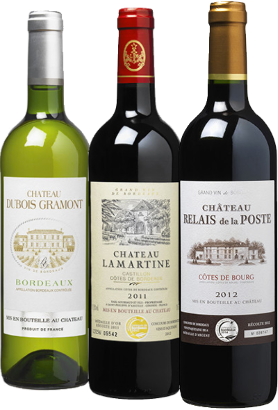 Subscribers can re-order the wines with 20% off the regular selling price and there is no minimum subscription – you can buy one box to see if you like the service. Sign up for either at yoursommelier.co.uk. (2017) This Right Bank wine is dominated by Merlot (85%) plus Cabernet Sauvignon and Cabernet Franc, from an appellation not far from St Emilion. The bit of bottle age has given nice tertiary development: a hint of truffle and green pepper, a bit of classic Bordeaux bloodiness, but the fresh blackcurrant fruit is to the fore. In the mouth it is supple and has a savoury fruit and spice character, good generosity but a tight, sinewy finish where the acid and tannin balance gives freshness. Very appealing. (2017) A 60/40 blend of Cabernet Sauvignon and Merlot, made in concrete vats, there's a smooth, classy aroma, all supple dark and savoury berries with a hint of spice and basil. In the mouth it's driven by ripe fruit and underpinned by a bit of serious structure: tannnis are grippy, the acidity fresh like plum skins, and that gives a cool, elegant length in the mouth adding to the sense of this being still quite young, and very nicely made.